Timewell Drainage Products, a family owned HDPE pipe manufacturer, is pleased to announce the acquisition of Midwest Plastic Products from Spell Capital. Midwest Plastic’s facilities in Jefferson, Wisconsin and Plainfield, Iowa will continue to manufacture drain tile and fittings joining Timewell’s existing facilities in Timewell, Illinois, Sibley, Iowa and Providence, Kentucky. Midwest Plastic Products, founded by Gary Fish, has more than 40 years of experience serving drainage contractors and farmers with HDPE pipe and accessories. The addition brings robust blow molding capabilities to Timewell’s operation, and Midwest Plastic customers will now receive a complete company manufactured product line including 2” to 18” single wall pipe and 4” to 48” MaXflo dual wall pipe. The company will remain headquartered in Timewell, Illinois with Darren Wagner serving as the president. With five manufacturing locations, the business will offer a broader product and fitting selection and an expanded geography to better serve new and existing customers. 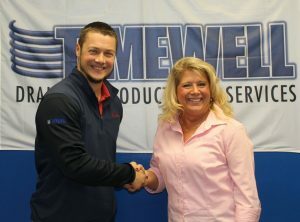 Darren Wagner (left) and Dawn Lucas (right) shake hands after announcing Timewell’s purchase of Midwest Plastic Products.